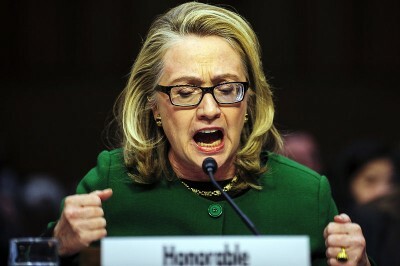 A Congressional hearing on the attacks against the United States compounds in Benghazi, Libya, the birthplace of the counter-revolution, focused on whether former Secretary of State Hillary Clinton, now a presidential candidate, was negligent in her duties leading to the death of an ambassador and several Central Intelligence Agency (CIA) personnel. These much-publicized hearings were portrayed by the corporate media and the Democratic Party as a politicized public relations exercise to damage the candidacy for the nomination of Clinton. United States Congressman Elijah Cummings, a Democratic from Maryland, repeatedly came to the defense of Clinton despite questions that were raised surrounding issues that would fall under the purview of the former State Department head and principal envoy during the first administration of President Barack Obama. Clinton represented the public face of the CIA-Pentagon-NATO campaign of destabilization, bombing and seizure of Libya. After the Libyan government under the late Col. Muammar Gaddafi began a military response to the obvious imperialist-backed war of regime-change, the Clinton state department engineered the passage of two United Nations Security Council resolutions which provided a rationale for the imposition of an arms embargo and so-called “no fly zone” over Libyan territory and waterways. These resolutions opened up a pseudo-legal justification for the massive bombing of the country during March 19 to October 31, 2011. Reports suggests that anywhere from 50,000-100,000 people were killed in the aerial bombardment leaving the infrastructure of the state destroyed, displacing two million people and prompting the precipitous rise in instability throughout the regions of North and West Africa, extending throughout the Middle East and Southern Europe. Libya under Gaddafi was designated as the most prosperous state on the continent which owed no money to the International Monetary Fund and the World Bank, utilizing its two million barrels of oil production per day to fund monumental projects which built schools, hospitals, power systems, homes and the maintenance of free education and healthcare. Today Libya has been reduced to one of the major sources of human trafficking and terrorism serving as a conduit for hundreds of thousands seeking to flee to Europe amid the ongoing imperialist war policy and worsening world capitalist crisis. The UN envoy to Libya has attempted repeatedly to bring together the two main identifiable regimes based in Tripoli and Tobruk. Both of these groups claim to be the legitimate representatives of the embattled state. Nonetheless, those who were leading figures under the Jamahiriya system of the Gaddafi-era have been assassinated, imprisoned or driven into exile. Members of the Gaddafi family and other officials are still being held in prisons where no credible judicial structures are in place to guarantee any semblance of due process. Nonetheless, during the Clinton hearings the total destruction of Libya, the destabilization of North Africa and the Middle East were never addressed. Whether the war of regime-change against Libya and other interventions such as the 2003-2011 invasion and occupation of Iraq were based upon false premises and misguided assessments, never came into the range of examination. Although the previous administration of President George W. Bush framed the invasion of Iraq as a humanitarian war, the actual social conditions of the people inside the country has rendered them to extreme poverty and deprivation. Millions of Iraqis have been both internally and internationally displaced. The Pentagon is still bombing Iraq under the guise of destroying the bases of the IS yet the invasion and occupation created the conditions for such groups to exist and flourish. During late October, a U.S. soldier was killed in what was described as an elaborate plan to weaken the IS. However, there is no end in sight under the existing administration of Obama or the one that will replace it in 2016 to Washington’s intervention in Iraq. In Syria, with the Russian-led aerial campaign against the armed opposition groups supported by the U.S., it has further exposed the failure of Washington’s policies in the Middle East. Four million Syrians have been driven out of their homes as a direct result of the Obama administration’s funding of extremist organizations which have killed hundreds of thousands of people. The Democratic and Republican parties in the U.S. advocate imperialist policies for Africa, the Middle East and throughout the world. Consequently since 1975, untold millions have lost their lives in Southern Africa, Afghanistan and South Asia, Colombia and throughout Latin America, the Middle East and the Asia-Pacific. These policies have resulted in not only the deaths and displacement of millions but also the driving down of living standards and greater insecurity and instability throughout large sections of the world. This global crisis encompasses the western industrialized states including the U.S. Such policies of war and economic exploitation cost the working people of the western countries trillions in wages and tax revenues. The continuing pursuit of aggressive militarism has diverted tremendous resources which could have been utilized in the elimination of unemployment, poverty, hunger, homelessness, state repression and environmental degradation so prevalent in the U.S. While the banks drove millions from their homes in major cities, suburbs, rural areas and small towns in the U.S., facilitating the closing of schools, the slashing of education and social services expenditures, under successive Democratic and Republican administrations, the state continues to propose and approve over $1 trillion annually for defense and homeland security. The state has attempted to explain these policies as a defensive measure against “terrorism.” Yet the terror of homelessness, job losses and police brutality is not even seriously discussed in the Congress or the Senate. Who will come to the defense of the nationally oppressed, workers and the poor among the members of the legislative, judicial and executive structures of the U.S.? This is more than a rhetorical question but one whose answer will determine the course of the struggle between late 2015 and the national elections in 2016. The working people and nationally oppressed cannot rely on the Democratic or the Republican parties to represent their interests within the capitalist-imperialist state. The masses need their own political party that can develop a program to end wars of regime-change and dominance and to ensure full-employment, quality education, universal healthcare, the protection of the environment, the total liberation of women and all oppressed groups and nations. Voting for either of the capitalist parties in the U.S. will only result in the same policies for the majority. During the course of the campaign for president no candidate for the nomination of either party is advocating the abolition of private property, national oppression and economic exploitation and adoption of an internationalist foreign policy that would recognize the right of oppressed nations to self-determination. These are the central issues that will determine the future of the imperialist states and indeed the entire globe. A discussion involving these aims and objectives must come to fore in the U.S. in order that actual conditions for the people improve and stabilize.